Even as gas prices have fallen of late, two Republican lawmakers want to make gas even cheaper. Sen. Mike Lee of Utah and Rep. Ron DeSantis of Florida introduced a bill that would gradually eliminate the gas tax that funds federal transportation projects. The two men unveiled their bill, called the Transportation Empowerment Act (TEA), on Wednesday. They propose cutting the current gas tax by 16.4 cents per gallon to just 3.7 cents over the next five years. READ MORE: Big Brother tax: US roads to be funded by tracked cars? Current funding for the nation’s transportation program expires on July 31, and includes about $50 billion in annual spending on road and transit projects. The Highway Trust Fund brings in about $34 million a year, leading to a $16 billion budget shortfall. “The federal government’s Highway Trust Fund is broke and another year of band aid funding is not going to fix it,” Lee said. The gas tax was introduced in 1956 to pay for President Dwight D. Eisenhower’s Interstate Highway System. The current tax of 18.4 cents a gallon was enacted in 1993. Revenue from the gas tax has dropped since it was introduced. Drivers are purchasing less fuel due to increased fuel efficiency standards and a move closer to cities, reducing commuting distances and allowing for better access to public transportation. The Highway Trust Fund is expected to decline further in the future, as hybrid and electric cars gain a bigger foothold in the market and as millennials continue their trend towards car-sharing services and reliance on public transportation over buying cars of their own. Washington Examiner blogger Michael Barone pointed out on Beltway Confidential that states are already sidestepping federal funding ‒ and red tape ‒ for their transportation projects that the Highway Trust Fund can’t afford to pay for. More than 30 states passed transportation finance measures in the last three years (ending in 2014), while another six have increased their state gas taxes. Jurisdictions have also increased local funding through tolls, bonds and sales taxes. “Our bill would update today’s broken infrastructure funding system by slowly cutting the federal gas tax, thus giving states the opportunity to better identify which projects need funding and how to fund them,” Lee said. He and DeSantis blamed politicians for diverting highway funds away from transportation projects and towards “bike lanes and walking paths and public transit systems in certain cities,” they wrote in an op-ed piece for the Daily Signal. “Meanwhile, partisan giveaways to special interests and bureaucratic skimming artificially inflate the cost of new infrastructure projects by as much as 20 percent,” they added. States are already funding 75 percent of the cost of maintenance of federal roads, the lawmakers noted. “By cutting out the bureaucratic middle man in Washington, states will be able to keep more of their infrastructure dollars at home where they belong and they will be able to avoid the costly and often duplicative federal regulations that can bring any infrastructure project to a screeching halt,” Lee said in the joint statement. However, several leading transportation groups have opposed dropping or cutting the federal gas tax, according to Transportation Topics, a trucking and freight transportation industry newspaper. 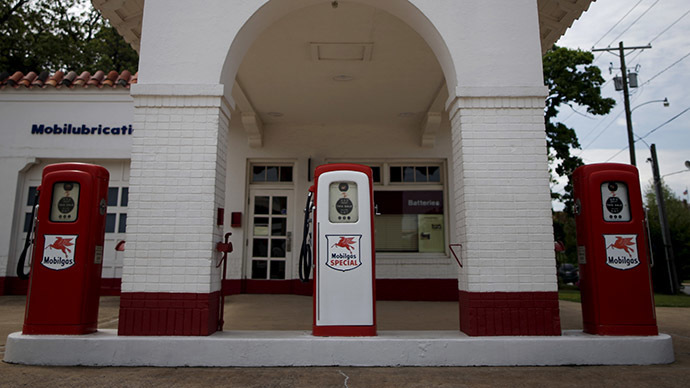 Under the lawmakers’ bill, the remaining 3.7 cents a gallon gas tax would be used to maintain existing interstate highways, while states would foot the bill for all their intrastate infrastructure projects. Lee introduced a similar measure in the previous Congress, which was sponsored in the House by Rep. Tom Graves (R-Georgia), but the session adjourned without advancing it. It was opposed by both Democrat and Republican leadership in both chambers, The Hill newspaper reported. The TEA bill has been referred to the various congressional transportation, tax and budget committees.